Never go into a fire-fight without your trusty barricades Set! 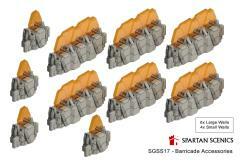 This accessory pack contains a number of sci-fi themed barricades which are ideal for breaking line-of-sight in games or for simply adding extra detail to your Spartan Scenics scenery sets. They also look fantastic on their own, making them a great addition to any sci-fi gaming board.